Throughout its 40 years, the Park Ave Summer Art Festival has presented a variety of style and price ranges of hand-made local and regional arts and crafts. From fine art to functional crafts, our goal is to present an eclectic mix of high quality pieces—which is why our jury meets each spring to review over 450 submissions spanning 23 states and Canada. This year brings an unsurpassed collection of returning favorites and fresh ideas. So grab some food, check out the booths, and feel the joy of discovering the perfect find! 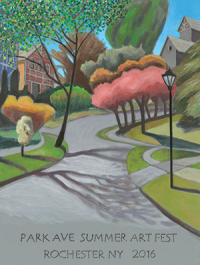 Where: The Park Ave Summer Art Fest runs along the tree-lined stretch of Park Avenue from Alexander Street to Culver Road. Park Avenue is closed to traffic from 9 a.m. until 7 p.m. on Saturday and from 9 a.m. until 6 p.m. on Sunday. The closest I-490 exits are Culver Road (Exit 19) or Goodman Street (Exit 17). When: Saturday, August 6, 10 a.m. to 6 p.m., and Sunday, August 7, 10 a.m. to 5 p.m. Parking: Free parking is available behind Gleason Works (1000 University Ave.) on Atlantic Ave and Elton St. and our new lot on Atlantic Avenue west of Culver Road, between Culver Rd. and the railroad underpass. Additional free parking can be found at Monroe Square on Monroe Avenue at Union Street, with shuttles to the festival. There is also limited HANDICAP ONLY parking in the Parkleigh lot on corner of Goodman Street and Park Ave. Enter lot from south side of Park Ave. Along the neighborhood side streets, one-side parking will be allowed for the duration of the festival. PLEASE READ SIGNS CAREFULLY TO AVOID BEING TICKETED OR TOWED. Side streets fill up quite early, so you may be better off choosing one of the free parking lots. Shuttles: Shuttles will be operating from Monroe Square, dropping off at Park Avenue and Alexander Street (west end of show). Shuttles from Gleason Works on University Avenue drop off at Park Avenue and Culver Road (east end of show). Both shuttles make an intermediate stop at East Avenue and Oxford Street for those who do not wish to walk the entire festival, or to allow transfer from the Alexander/Monroe Square shuttle to the Culver/Gleason Works shuttle or vice versa. There is a $2 round trip charge. Handicap Access: One shuttle on each route is handicapped accessible. There is limited handicapped parking at Parkleigh at the corner of Goodman Street and Park Avenue. Family-friendly and environmentally friendly event: No dogs or other pets, bicycles, skateboards or roller blades are allowed on Park Avenue during the festival. Alcohol is not allowed.